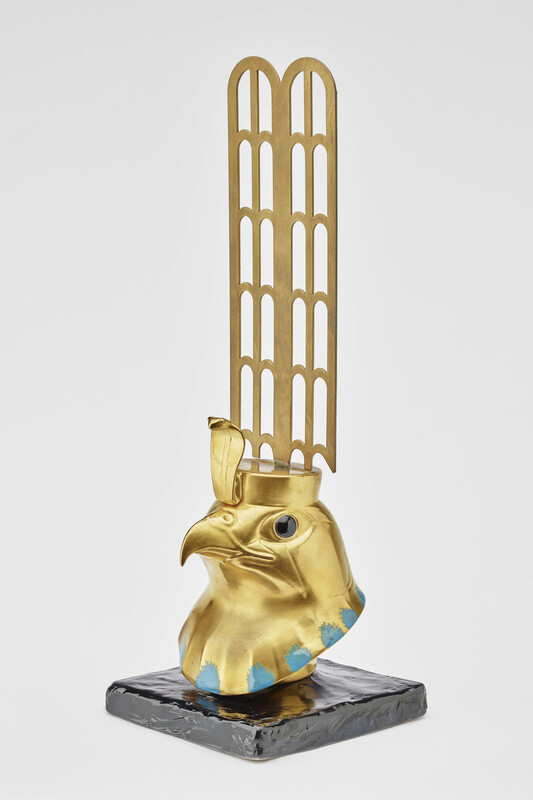 This is a porcelain and yellow metal version of the gold model of Horus (with obsidian eyes and turquoise inserts) excavated at the temples of Nekhen and now at the Egyptian Museum, Cairo. This ancient model dates to the Sixth Dynasty (2323-2150BCE). Horus was the god of the sky and of kingship; for a time during the Ancient Egyptian period, the Pharaohs were considered manifestations of Horus. Boehm produced these models as part of a set of porcelain models copying Ancient Egyptian originals which were issued when the Tutankhamun treasures toured the world between 1972-81. The first location on the tour was the British Museum, and it remains their most popular exhibition to date.